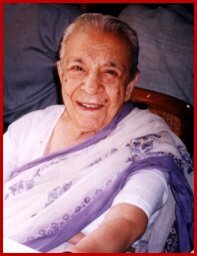 Zohra Segal (born in 1912 at Saharanpur, UP) has lived an era as an actress and dancer - The leading actress of Prithvi Theaters, Bombay, a leading dancer of the Uday Shankar Ballet Company of pre-independence days and a leading light of IPTA. Acting has been her first love. In her magnificent theatre career, she has toured all over the world. She has performed in more than 112 cities of India and has been honoured with innumerable awards including the Sangeet Natak Akademi Award for acting, the Padmashree for her contribution to theatre, the Kalidas Samman and the title of Legend of India for her lifelong contribution to Indian theatre. She has also acted on the British Stage, in tele-dramas and films some of which are “Tandoori Nights”, “Jewel In The Crown”, “Partition”, "Bhaiji On The Beach”, “Bend It Like Beckam”, “Anita and Family”. She is now a popular performer in Bollywood. She recites poems in Urdu and in English.